UAV inventory of 100 to 10,000 over a 10 year period. There issue as mariners and legislators debate whether unmanned are several terms in use for unmanned aerial vehicles, includ- vessels can operate safely in the vicinity of manned vessels. ing Unmanned Aircraft System (UAS) which has generally While con? dence is building in the wider shipping commu- been adopted by defence and civil aviation authorities. 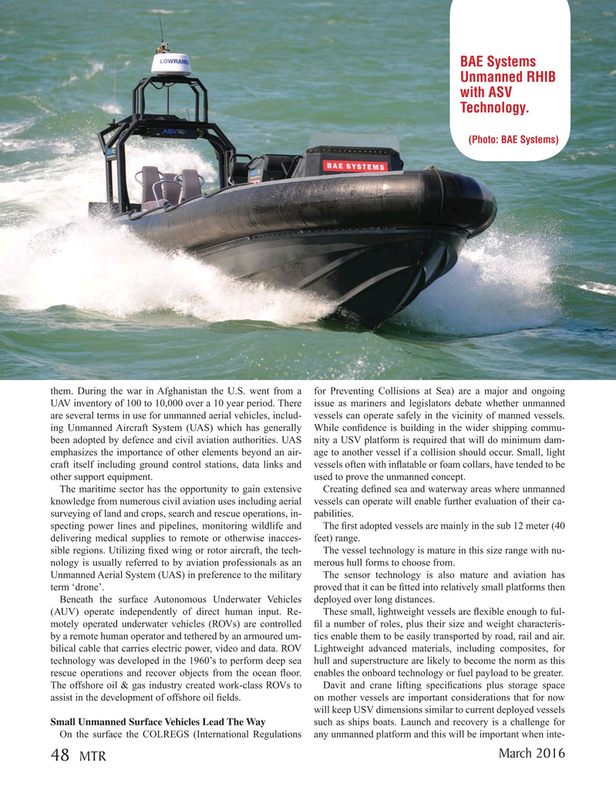 UAS nity a USV platform is required that will do minimum dam- emphasizes the importance of other elements beyond an air- age to another vessel if a collision should occur. Small, light craft itself including ground control stations, data links and vessels often with in? atable or foam collars, have tended to be other support equipment. used to prove the unmanned concept. The maritime sector has the opportunity to gain extensive Creating de? ned sea and waterway areas where unmanned knowledge from numerous civil aviation uses including aerial vessels can operate will enable further evaluation of their ca- surveying of land and crops, search and rescue operations, in- pabilities. specting power lines and pipelines, monitoring wildlife and The ? rst adopted vessels are mainly in the sub 12 meter (40 delivering medical supplies to remote or otherwise inacces- feet) range. sible regions. Utilizing ? xed wing or rotor aircraft, the tech- The vessel technology is mature in this size range with nu- nology is usually referred to by aviation professionals as an merous hull forms to choose from. Beneath the surface Autonomous Underwater Vehicles deployed over long distances. (AUV) operate independently of direct human input. Re- These small, lightweight vessels are ? exible enough to ful- motely operated underwater vehicles (ROVs) are controlled ? l a number of roles, plus their size and weight characteris- by a remote human operator and tethered by an armoured um- tics enable them to be easily transported by road, rail and air. bilical cable that carries electric power, video and data. ROV Lightweight advanced materials, including composites, for technology was developed in the 1960’s to perform deep sea hull and superstructure are likely to become the norm as this rescue operations and recover objects from the ocean ? oor. enables the onboard technology or fuel payload to be greater.